Photo via the referenced eBay posting. As we’ve discovered, the most valuable Capitals bobbleheads are those given out at the blood drives, because they’re more limited than the others and you’ve got to give blood to get one. This weekend, the Caps held another Inova blood drive, with Semyon Varlamov bobbles as the prize to those who rolled up their sleeves. Sure enough, a few folks who either participated in the blood drive or weaseled their way into getting a Varley bobblehead have listed the item on eBay, and they’re sure to get a nice payday out of it. Here is one, already trading at $35 with a couple days remaining. Here’s another, trading at $31 with eight days remaining. And… one for a starting price of $199.95. That’s some expensive blood. 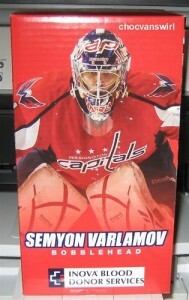 Expect more Varlamov’s to be listed. Let’s see if Varley can eclipse the $114 a Brooks Laich bobblehead sold for back in December. 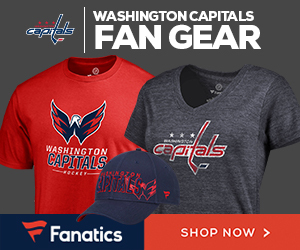 Read more about Capitals Bobbleheads, with a Mike Knuble interview, from our December post. Gunaxin.com, a site for guys about sports, girls, humor, media, gadgets and grub.